The Smugglers Den was originally a barn, the date of construction uncertain. Prior to the 1930s the barn had been used to store coal transported down by ship from Newcastle then brought up river by Thames barges. ('Days Gone By' by Len Warren). In 1927/28 a Mr and Mrs Wallaker bought the barn along with Wharf House next-door. 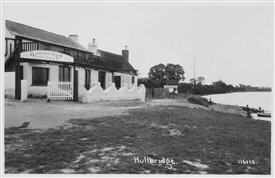 The Wallakers converted the barn into a dance hall which they named the Hullbridge Pavilion, selling teas and confectionary to the village tourists. On Saturday night Old Time dances and concerts were held. Later, presumably under new ownership, it was renamed The Smugglers Den Social Club and licensed to sell alcohol in 1947. My own recollections of the Smugglers is from the 1980s and 90s. Denis and Mary Rigby were running the club at this time. Under their stewardship the club was hugely successful. Part bar, part restaurant. Mary providing superbly cooked meals. Denis a builder by trade, a genial and sociable host, well known for his rendition of Frank Sinatra's 'My Way' would do his bit behind the bar. Figures not being a strong point with Denis the cost of a round could vary quite a bit! A popular event at the Up River Yacht Club regatta day was the 'Greasy Pole' bagging contest over the river. Denis and friends would stage these contests after constructing the apparatus from heavy poles at low tide. The first postcard picture was published by Bell. It shows the Pavilion early 1930s just after its renovation. 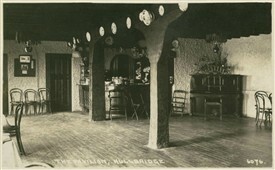 The second postcard picture is by Alfred Padgett of the Pavilion interior also early 1930s. This page was added by David Whiffin on 28/10/2013.